Possibly the nicest airplane tie yet. Has a variety of small, cute, airplane figures tightly patterning the 100% silk tie. Navy. Standard 58" long. Review: The tie is attractive and good quality. I was able to wear it to the 2016 Minnesota Aviation Hall of Fame Banquet and had some comments. Ordering was easy and your system for processing was refreshing. Review: This was a gift, but my pilot son-in-law Adam loved it and so did his son. 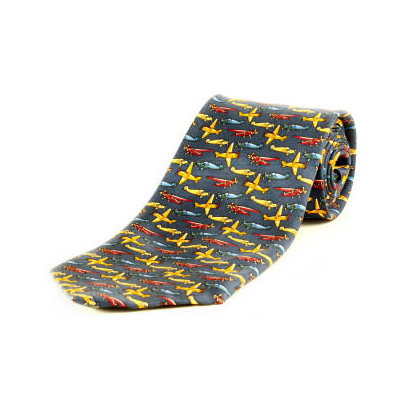 Great looking tie for any guy, not just a pilot! Review: Gave this tie to my son as a gift, he loved it! Nice looking, sharp colors, good quality. Just as wonderful as your reviewers said it was!!! Cons: there are none as far as I am concerned. A: The length of this tie is approximately 58", a standard length.